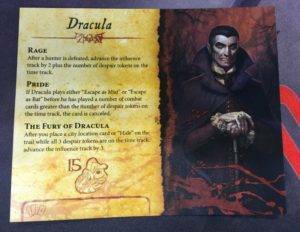 Fury of Dracula (3rd/4th edition). 2-5 players. 120-180 min. playing time. Age 14+. Third edition published by Fantasy Flight Games, fourth edition by WizKids. Yes, horror-themed board games that are not Lovecraft-inspired do exist! Today we will explore Fury of Dracula, a game of vampire hunters versus the Prince of Darkness himself, Dracula. Players take the roles of Bram Stoker’s vampire hunters—Van Helsing, Lord Godalming, Dr. John Seward, Mina Harker. But there’s a twist: one player assumes the role of Count Dracula. The rounds are divided into day and night phases. Hunters may act in both day and night, moving from city to city throughout 1898 Europe via roads and railroads, and supplying themselves with garlic, stakes, and other implements of vampire destruction. Dracula, as expected, may only move during the night phase, but his actions are in secret, restricted to roads. This secrecy is accomplished by an event track that moves as play continues. When the cards have reached the end of the track, if the heroes have not located him by that time, Dracula emerges and wreaks havoc. Along the way, he can put out rumors via particular cards and advance the influence track to foil the efforts of the heroes. The hunters must work together and use their deductive abilities to locate the vampire before he achieves mastery. When the hunters encounter a new vampire, or even Dracula himself, combat ensues! Players must be clever to avoid the dangers the vampire can throw at them. Dracula has bodyguards and supernatural powers with which to attack without putting himself in danger. 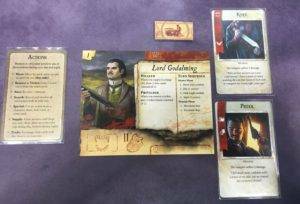 The third edition of Fury of Dracula emerged with new graphics, and they beautifully complement the atmosphere of the game. Chris Beck and Samuel Shimota are credited with the artwork. Earlier editions of the game were designed by Stephen Hand, while the third and fourth editions are credited to Frank Brooks and Kevin Wilson. If you want to see a very fun gameplay, check out TableTop on the Geek and Sundry YouTube channel. 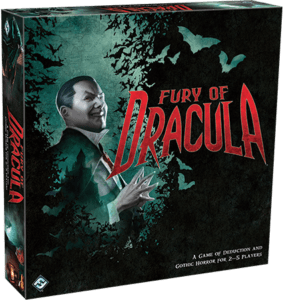 Wil Wheaton, Grant Imahara, Amy Okuda, and Ify Nwadiwe play Fury of Dracula in a two-part episode full of laughs and exciting play. For a challenging evening of Stoker-related fun, play Fury of Dracula. Win or lose, you’ll enjoy the experience. In this column, I bring you reviews of horror board and roleplaying games, as well as interviews with writers and creators of such games. Please feel free to ask questions or give me suggestions of games I should review or writers you’d like to see interviewed. Contact me at HorrorGamerDonnaEldritch@gmail.com. 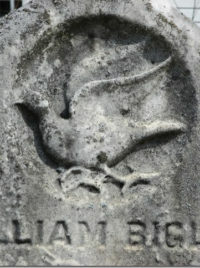 Donna K. Fitch, MLS, is a long-time HWA affiliate member, Silver Hammer Award-winner, and HWA Newsletter Web Designer. She is the author of Second Death, The Source of Lightning, and The Color of Darkness and Other Stories. 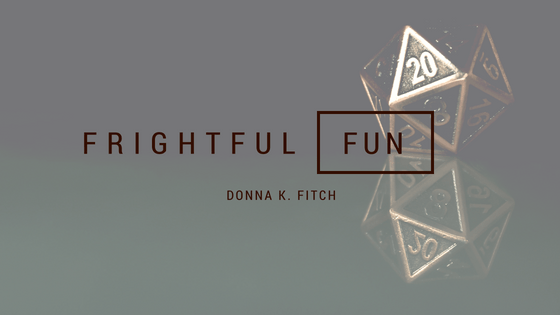 In addition to novels and short stories, Donna wrote a now-out-of-print RPG supplement on using cemeteries in d20 games, a gaming supplement called Sahasra: Land of 1,000 Cities based on a fantasy India, and a chapter of Scott Carter’s Imperial Age: Faeries. A former librarian, Donna works as a Web designer in the marketing division of Samford University. She and her husband and two black-and-white cats live in a suburb of Birmingham, Alabama.